Montana Buffalo Company LLC is located north of Gardiner. 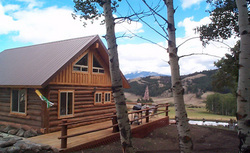 Real log cabin in a quiet and beautiful setting on our buffalo ranch. Buffalo and horses roam the mountain ranch. We have ponds, streams and waterfalls around the cabin. Cabin sleeps up to 8. We have hiking, horseback rides, fishing, snowmobiling, hot tubing or just plain relaxing in a hammock amongst the aspens and wildflowers. Directions: Montana Buffalo Company LLC is located 7 miles north of Gardiner, up in the mountains next to Yellowstone National Park.